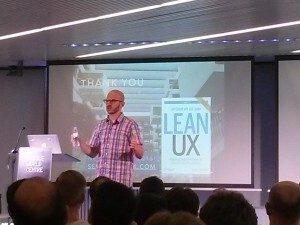 At the last minute, on a typical warm, sticky Barcelona summer evening in August, I decided to go to Jeff Gothelf’s Lean UX talk at the Mobile World Center. It was announced as “Better Product Definition with Lean UX and Design Thinking” and as I’d read parts of the book, I thought it’d be interesting. I was especially looking forward to the better product definition part. Jeff started with an invitation to ask the question “So what?” after creating a new feature or releasing something new. “What’s the impact?” is what we should be asking ourselves. It’s great that we have added something but we need to measure what has changed. Amazon releases new code into production around 5 times every minute and measures the impact. If we are releasing less often (and most likely we are) then we should also measure what the impacts are to our product. Humility is key and we should be humble enough to say that we don’t know the answer to all our users’/clients’ problems. They are guesses, nothing more. We need to focus on taking the assumptions that work and improving on them little by little. Retrospectives will help the team identify and improve their assumptions. He then brought up the example of MapMyRun app that does what the name says...it maps your run. Jeff asked the audience who runs and after a show of about 20 hands, who stops to take photos of nice places they run past? Only 2 people admitted to it and he mentioned that of course, it’s a stupid idea as no-one does it. Then he showed the screenshot of an “MVP Feature” in the app that asked if you wanted to take a picture, leading the user to a premium sign-up page which had a monthly and annual price for extra services. He then explained how maybe taking a photo was not such a stupid idea, much to the delight of those who had their hand up admitting to it in the first place. Here he reinforced the idea of the MVP, citing the Concierge model or the Wizard of Oz being his favourite types. MapMyRun was testing to see if customer’s would pay for that option without creating it first. "The smallest thing we can do to make or test an assumption"
When we are testing these assumptions we should use both qualitative and quantitive data. Get out and speak to your customers or users. We should be concentrating on changing the customer’s behaviour, only then are you making an impact. 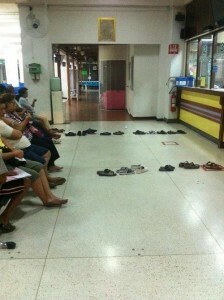 He showed the great image of the shoes being left in a line in a post office in Thailand. The Q&A session after the talk had a couple of good questions and Jeff was able to reply easily. I enjoyed the “How do you create hardware with short development cycles and incoporating the learning?” It’s a question that I’ve often heard from people and I think it’s asked a lot as there are not as many well-publisized examples of using this way for creating physical products. He talked about using light-prototypes and getting early feedback, adapting what software teams do - trying to keep the changes to the smallest possible thing to test an assumption. Another question went was how Scrum and Lean UX work together. 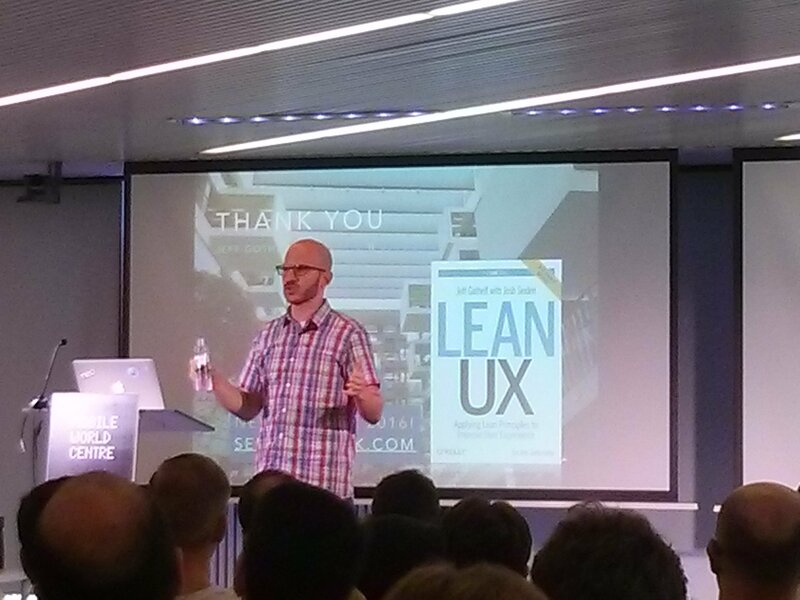 He went into detail on how Lean UX and Scrum dovetailed well. The successes should be discussed in the retrospectives and possibly the backlog will be changed to reflect the learning. Designers should ideally be on Scrum teams and work together with the engineers. This is the best way forward.